BeneVir is a speculative system that provides genetic biosecurity for future populations. It is a company that provides genome storage, "updates", and gene analysis for individuals in a future where genetic biohacking and gene-based crimes are a reality. If you project the current rate of progress of computer processing and genetic biotechnology into the future, it is reasonable to assume that in 50 years, gene-editing services will be as ubiquitous as laptops, and genetic attacks will be as real of a threat as chemical warfare. BeneVir (a portmantrau of "benevolent virus"), is a gene security that safeguards citizens against gene-based attacks by offering 3 core services: gene "updates" akin to software updates that guard the genome against attack, DNA storage similar in function to the Svalbard Seed Vault, and genetic analysis, an evolved version of the services offered by companies like 23andMe today. This broad and deep research helped us develop an informed foundation from which to have interesting speculative brainstorm sessions. We had a very clear framing statement and system map, so our initial product brainstorm yielded four concepts that complimented each other; Richard urged us to carry all four of them forward into our final presentation under the business umbrella of a speculative biosecurity company that he called “BeneVir” (off the top of his head!). 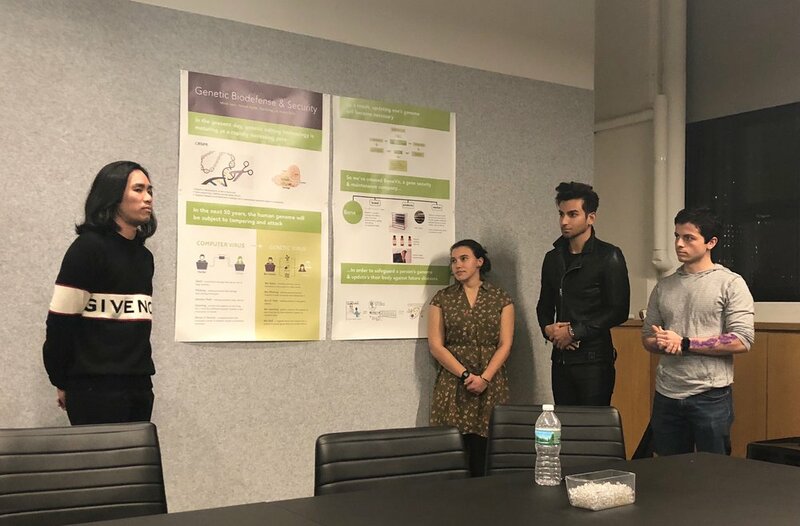 Our final tasks were to develop a cohesive presentation, which we accomplished by telling a story through our poster and by using physical prototypes to immerse the critics into our future world. BeneVir customers submit DNA samples to the company, which copies each person’s genome and stores it in a high-security vault as a physical sample. The company identifies a unique, inert “tag” in each genetic sequence, which functions as an IP address or Social Security Number for the customer. Customers can then choose to get a biosecurity-monitoring tattoo, which remains invisible until the cells within it are infected with a new DNA sequence that does not contain the gene tag, causing it to change color. This system resembles the current health insurance landscape, where better health insurance results in better coverage. However, costs for buyers are greatly reduced by the intercompany trade of data and research – information is secure, but not necessarily private. Our biggest success was synthesizing our research to find a direction in the field of genetic biosecurity. Early on, we recognized that the scope of this topic would require a strong framing statement, and a lot of research to help us identify and support the framing statement. However, we were proud that in the short time we had with this project, we became acquainted with the current landscape enough to speculate 50 years down the line. We learned that, when handed a large, even daunting topic, it is beneficial to narrow focus. It is okay to design something to affect only part of the system, or perhaps design something that can have a chain reaction on the system and influence change that can then be studied. The Biocrime Prophecy ”, an article co-authored by Mark Goodman and Andrew Hessel for Wired, was one of the most pivotal research articles for this project, as it introduced the parallels between cybercrime and future biocrime. Throughout this process, we were often stunned with the technological advancements in the field of genetic biosecurity as well as the rapidly increasing pace of innovation. For example, the price of complete genome sequencing is about $1000 USD right now, but is expected to be almost free about 20 years from now. In order to prepare for the darker consequences of this progress, one can continue this comparison with computer technology: malware, spam, and denial of service are all examples of cyber attacks that have genetic parallels. Denial of service (DoS) attacks, for example, are a type of cybercrime that can cause large-scale economic damage with minimal permanent damage to code or infrastructure (see the DoS attacks that hit major US banks in September 2012). The biological analog of this type of attack might be an engineered virus that simply causes lethargy or a slower metabolism for anyone infected in a region, slowing commerce and increasing health costs with minimal damage to people or infrastructure.